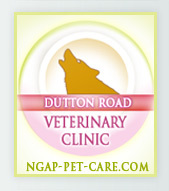 It was Saturday, October 11, 2008 and many of us from NGAP were in Dewey Beach, Delaware rejoicing. It was the first day of freedom for three greyhounds released from the Animal Medical Center where they had been held captive as blood donors for a long, LONG time. Thanks to the help from a third-party organization, the Animal Medical Center agreed to release these three dogs to an organization in Massachusetts. A volunteer from an advocacy group with a Massachusetts accent and a Massachusetts driver's license and tag picked up these three greyhounds. The driver and one of our volunteers rendezvoused in New York City and the dogs were transferred to one of our vehicles and transported to our kennels here in Philadelphia. We call this the 'Greyt Greyhound Sting of 2008'. We at the NGAP house broke out the champagne and toasted the freedom for these three greyhounds who were finally able to run in our long runs until they were tired. 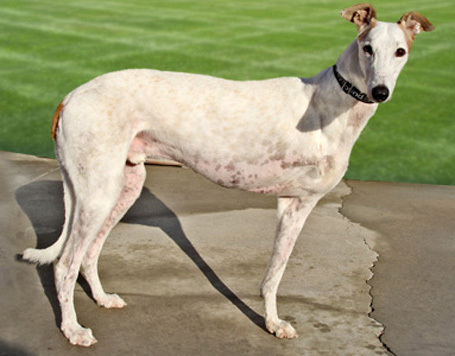 We obtained one more greyhound from the AMC in much the same manner a few months later, making the total four. We were overjoyed at our success! 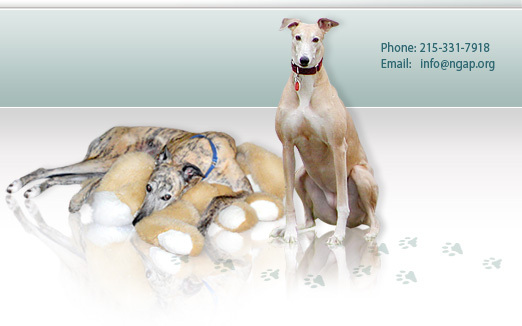 Three of the four greyhounds from the Animal Medical Center have now been adopted. Paddy was placed in a wonderful home in New York State, Spuds to a previous NGAP adopter, and Player to a very, very special family. Houdini, the last of those greyhounds, may very well spend the rest of his life with us due to medical reasons, but he is currently doing well. But this story is really about Player. For a short while, when we didn’t want his identity to be known, we listed Player as ‘Rock’ or ‘Steady as a Rock’ because that’s what he was on his three legs! Player came to us from the AMC with only three legs. His amputation was supposedly a result of infection from an injury but the details were hazy. During Player's year-plus stay with us, we think he may have had a small stroke. Fortunately, he weathered the storm, came back strong as ever and was able to spend his last eight weeks with us at our new kennel which we moved into on October 16, 2009. We always put him out in the run by himself for safety reasons, but there were always numerous dogs in the adjoining runs that he could see and race with. It gave us all great pleasure to watch Player run. On Saturday, December 19, Player went to an adoptive home. For us, next to moving into the new kennel, it was the most wonderful moment of the year. At our last update, Player was doing just fine, loving his new environment, enjoying life and being loved. Anyone that loves greyhounds has to be touched by Player's story. 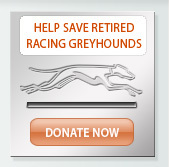 Like so many other greyhounds, he only needed a chance to win - and he has finally done that!